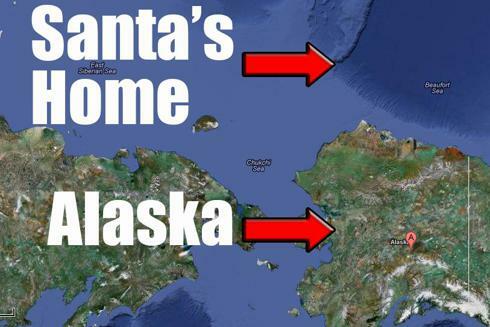 In fairness to Royal here are their safety plans for the Arctic. While we are not thrilled about Arctic drilling we actually have an ulterior motive for our "stance" on Royal here: put options. If we have a belief that a stock will go down we can profit from that and limit our downside by buying put options. Repeat: I don't actually advocate this trade (here are trades I like), I wish instead to demonstrate how to take a bearish position on a stock using put options. The first thing you should know about buying put options is that they are a depreciating asset all things being equal. Just like when you buy a new car it loses resale value as time passes, so it is with buying put options. Part of the value of an option is how much time it has until it expires and that means options lose value over time even as the underlying stock stays unchanged. Most non-professional investors never consider writing (selling) options and this is a shame because being on the buying side means time is always working against you. If you are the seller time is always working for you. Nice work if you can get it. So as we explore this trade put yourself in the shoes of both parties, buyer and seller. This is probably the most important lesson an investor new to options can recognize - it is usually better to be the seller than the buyer of options. Having said that, buying puts can be a profitable way to capitalize on a stock's downside, and unlike shorting a stock outright your losses cannot exceed your initial outlay. Puts also provide leverage. A put is the right but not the obligation to sell a stock at an agreed upon price until an agreed upon date. The agreed upon price is the "strike" and the date that the rights end is the "expiration." So lets say Royal trades at $10, we buy a put for $1 with a strike of $10 and an expiration of Dec 31. This means that anytime between now and the end of the year we can execute our right to sell a share at $10. So if Royal trades at $5 this year we could exercise our right to sell at $10, netting us a $4 profit ($5 - our original $1). In practice we would sell our put to someone else who actually has shares to sell instead of exercising it but the resulting profit is the same (minus a very small percentage). In this scenario Royal dropped by 50% but your profit was 400%. This is the "leverage" of put options and is one of the advantages over shorting shares outright. If Royal was trading at more than $10 dollars and Dec 31st came around our option would expire worthless. This is the tradeoff of put options and is the reason why people write (sell) them. If the stock traded at a price higher than our strike then our put option would be OTM (out of the money) and in danger of expiring worthless. ITM (in the money) means the stock is trading lower than our strike price and our put has "intrinsic value." ATM (at the money) means it is at or around our strike. You see the acronyms ITM, ATM, and OTM all the time in options discussions. Options like this also trade in lots of 100. So in the above example if a put costs $1 it really costs $100 and you get the right to sell 100 shares. Prices, however, are usually quoted per share. Let's have a look at the put with a strike price of $67.50. 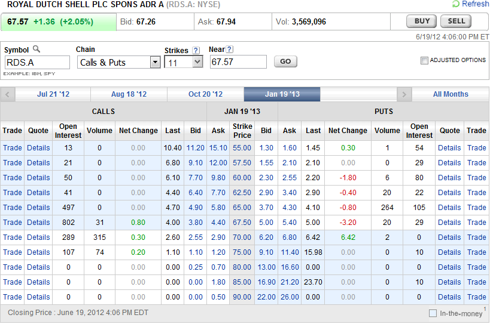 Royal last traded at $67.57 so this option is as close to ATM as you can get. A more conservative approach would be to pick an ITM put that is more expensive but is less likely to expire worthless. If we were more aggressive we could get OTM puts that would allow us to buy more puts because they are cheaper but they come with the likelihood of expiring worthless. We'll stick with ATM. Under the "Ask" column we see $5.40. This means that someone who has enough cash to fill the order will sell us the right to sell them 100 shares of Royal between now and Jan 19 2013 (the expiration) for $540. Let's look at the details of this put being offered. So let's take the plunge. We will call this the "Polar Bear" trade (it is important to name your trades). This trade will start out with an immediate paper loss, as buying a put always does. The put is being offered for $5.40 but has a bid of $5.00 if we wanted to close the trade. This is the spread and you can read here how it is related to liquidity. Disclosure: I am long ACI.